Entrance fee for the Sule Pagoda - 3000 kiats. Visiting hours of the Sule Pagoda - 6am to 8pm. The Sule pagoda is about 2,500 years old and contains a hair relic of the Gautama Buddha. It is believed that a powerful nat spirit called ‘Sularata’ resided at the site. The British used the Sule pagoda as the centre of town planning during the colonial era and Burmese Royalty used it as a meeting point while it was used in the recent past as a gathering point by the activists of the 1988 uprising and the Saffron Revolution in 2007. 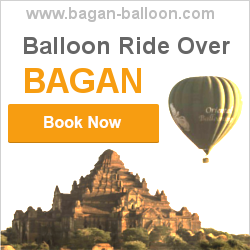 Sule Pagoda’s ideal location makes it an attractive place to start a city tour. There are four entrances to the pagoda and it is close by the attractive colonial style buildings of the city. 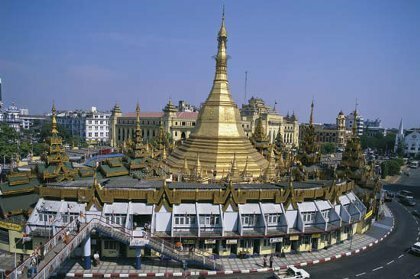 The Sule Pagoda is located in the heart of Yangon at the meeting point between sule Pagoda road and the Mahabandoola road. In fact the name ‘sule’ comes from the Burmese word ‘suway’ meaning ‘meeting’ which rightly describes its location. The Sule Pagoda is shaped like a dome and there are smaller stupas, 10 bells made of bronze and 8 Buddha images around it. These eight Buddha images represent the days of the week with one extra image for Wednesday. Style of the Sule Pagoda - "Mon" style. Shape of the Sule Pagoda - Octagonal.